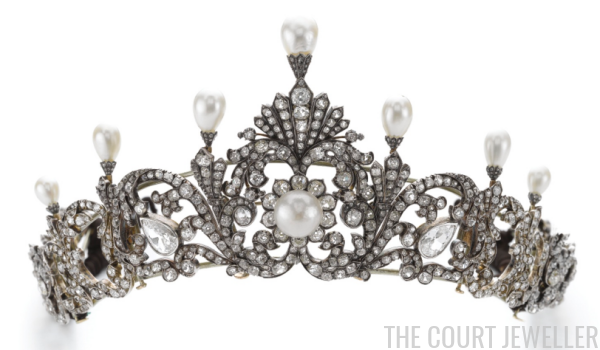 Lot #151: A Seed Pearl and Diamond Tiara, ca. 1915. According to the lot notes, this tiara is currently the property of "a lady." The notes describe the tiara as "of open work, foliate and floral design, millegrain-set with circular-, single-cut and rose diamonds, further highlighted with seed pearls." 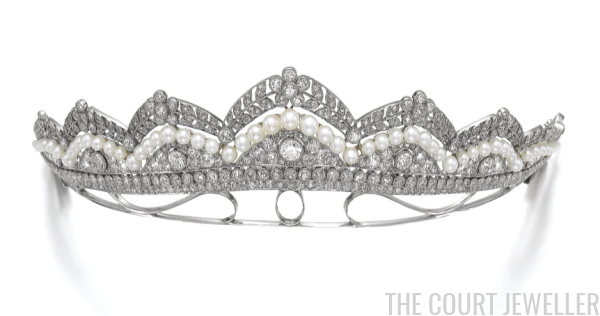 The tiara is estimated to sell for between $28,900 and $39,250. 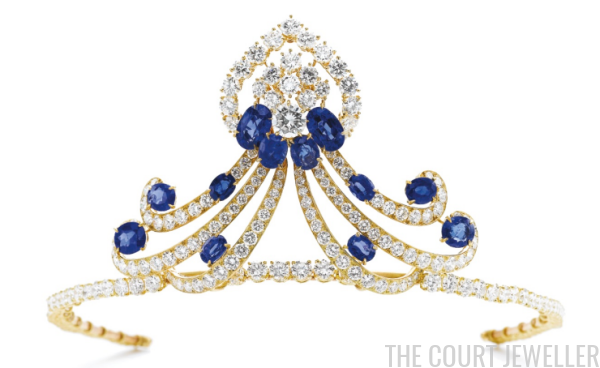 The tiara and earrings are both being offered from "an important private collection." 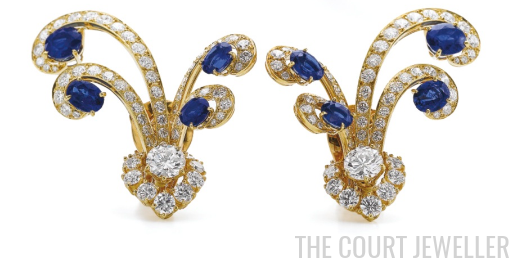 The entire set has an estimated sale price of between $70,200 and $101,100. Lot #295: A Natural Pearl and Diamond Tiara, ca. late 19th century. This sparkler is described in the lot notes as "of foliate and scroll design, set with pear-, cushion-shaped, circular-, single-cut and rose diamonds, and a button shaped natural pearl ... surmounted by seven detachable drop shaped natural pearls." The piece also separates into "eight jewels," three of which can be worn as brooches. It comes with a fitted case. The piece is also being sold by "an important private collector," and it's estimated to bring between $258,000 and $465,000. 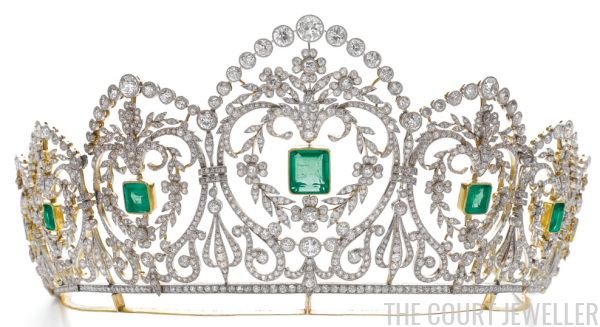 Lot #389: An Emerald and Diamond Tiara, ca. 1910. Lot notes describe this intricate tiara as "of floral, foliate and garland design, millegrain-set with step-cut emeralds, circular-, single-cut and cushion-shaped diamonds." The emeralds are Colombian; the tiara was made in France. It's being sold by "a European noble family." (It's similar in design to the tiara owned by the Harcourts, but I don't recognize the piece.) The piece is expected to fetch between $206,000 and $413,000. Which royal ladies would you like to see wearing each of these tiaras-for-sale?